Easier climbs in Moab are far and few between, but more have been popping up in recent years. The Ice Cream Parlor has a variety of climbs including a number of 5.5-5.9 level, as well as some 5.12s to keep everyone busy. In the morning, it will be shady and in the afternoon there will be direct sun. The Ice Cream Parlor has a variety of climbs of all levels. It is a great, get your feet wet in desert climbing area. Of the 25 climbs on the Ice Cream Parlor, 14 are under 5.10. With nine climbs under 5.8 starting at 5.5. Routes are a mix between bolts and trad. As it is a high traffic area, set up and anchor to run your rope through. Do not go through the bolts! In the heat of the summer, it is a great morning climbing area as it is in the shade. In cooler times, with direct sun, it is a better afternoon climbing area. If it is super hot, cooling off in Kane Creek is a great option. Mountain Project has good details on the routes. 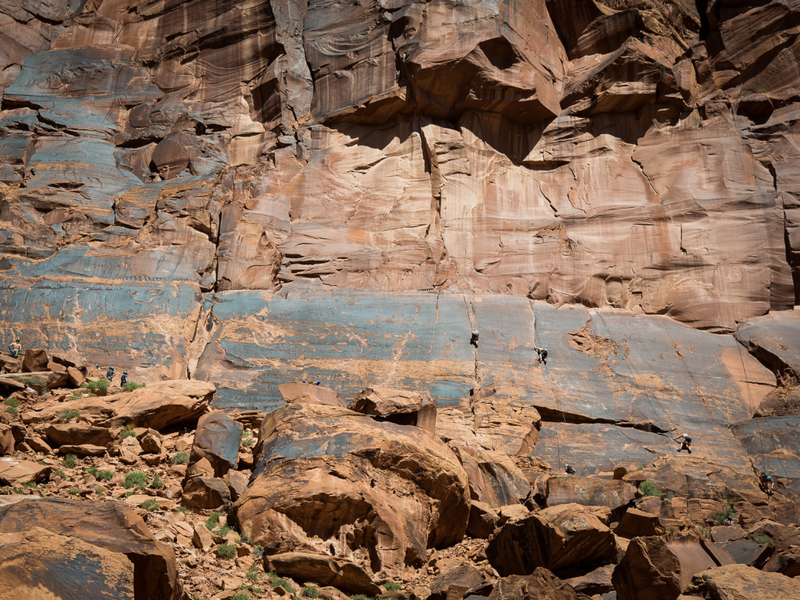 7.2 miles from Moab, this is an accessible climbing area with something for everyone. Be careful driving as this is a multiuse area and there will be mountain bikes and motor heads cruising around. As it is one of the few places with easier climbs, it is very popular and can be busy. From town turn onto Kane Creek Road (between the Burger King and McDonalds. Drive to parking at 7.1 miles or 7.2 miles and park. The climbing area is up to your left. The trails are easy to follow. This is BLM land; there is no fee to climb here. As it is BLM, dogs are allowed. Be careful with dogs, and driving in general on Kane Creek Road, as it is a multi-use area, expect to see bikers and motor heads.